During the 1990s and early 2000s, the "Clinton body count" conspiracy was all the rage. Perhaps you got the same chain email I did: did you know over 50 individuals connected to President Bill Clinton have died in mysterious circumstances? The conspiracy relied on a combination of innuendo and statistical ignorance. Most of the "Clinton connections" are simply fabricated: a cashier killed by a robber was actually an "accountant for the CIA." The dozen or so deaths remaining seems high, but tens of thousands of people are vaguely "connected" to a president: Four Marines who were killed in a helicopter crash were listed because Clinton was on the helicopter two months earlier. 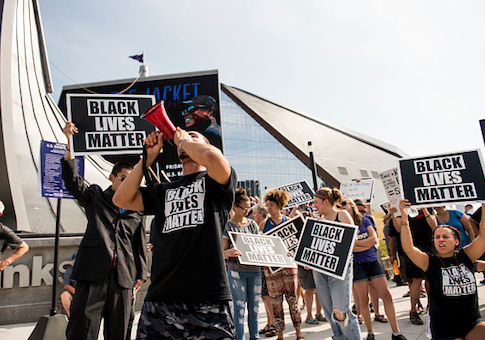 A new, woke version of the body count conspiracy has cropped up in liberal circles, with mysterious government assassins targeting protesters of the 2014 police shooting of Michael Brown in Ferguson, Missouri. "Puzzling number of men tied to Ferguson protests have died," reads the Monday headline from the Associated Press. Other outlets have expanded on this innuendo: "Deaths Of Six Men Tied To Ferguson Protests Prompt Fear Of Sinister Connection"; "Deaths of six men tied to Ferguson protests alarm activists"; "Deaths of Ferguson activists lead some to believe something sinister is at play." Despite its "puzzlement," the AP cites police statements noting most of the deaths weren't murders and also the crime rate and lack of mental health resources available to black Ferguson residents. But the AP also takes a bizarre "both sides" approach to the issue, quoting activists insisting there is something sinister going on, perpetrated by shadowy "white supremacists or police sympathizers." The deaths are listed out one by one, often with clarifying details omitted. The result of the framing is the far left cited the AP story on social media as vindication for the conspiracy. Do you remember when this was 1? Then 2? Last year I shared when it got to 4. I'll just say it- Ferguson protesters are being murdered extrajudicially by the State. There's nothing puzzling about it. As with the Clinton conspiracies, the "Ferguson body count" is less scary when considering that thousands participated in the 2014 protests, the deaths took place over a span of five years, and that some of the dead men's connections to the protests are dubious. "Deandre Joshua's body was found inside a burned car blocks from the protest. The 20-year-old was shot in the head before the car was torched," the AP reports. What they omit is that Joshua's family say he never joined the protests. His inclusion in the list likely stems from viral rumors at the time that he was killed after testifying in the Michael Brown case, another claim his family denied. "MarShawn McCarrel of Columbus, Ohio, shot himself in February 2016 outside the front door of the Ohio Statehouse, police said. He had been active in Ferguson," the AP writes. McCarrel was a member of the Ohio branch of Black Lives Matter, but he never actually participated in the Ferguson protests. If an out-of-state activist is counted as "tied to Ferguson," then the pool of those "tied to Ferguson" is likely hundreds of thousands, so large that six deaths is a drop in the bucket. AP reports that "24-year-old Danye Jones was found hanging from a tree in the yard of his north St. Louis County home." However, as they note, it was his mother who was active in Ferguson, not him. She insists her son's death was a lynching, but police say there was no sign of a struggle and the family themselves reported it to police as a suicide. This leaves us with only three deaths of actual Ferguson protesters. Yes, "Edward Crawford Jr., 27, fatally shot himself in May 2017 after telling acquaintances he had been distraught over personal issues," but AP omits that he did so in front of two witnesses. Bassem Masri was found dead of a fentanyl overdose on public transportation; AP omits he was open about his history of heroin addiction. Darren Seals was killed in the same manner as Deandre Joshua, likely prompting the conspiracy theories in the first place. But a Daily Beast investigation found four other men in the Ferguson area were also found shot in cars that were set on fire, with three killings confirmed to be carried out by locals. It seems to be a common MO in the area to burn cars to destroy forensic evidence. Seals also sadly fits the profile of the sort of man who might find himself caught up in violent crime. "Caught my first felony at the age of 18 for slamming a cop on his head. Was shot 7 times and had a smile on my face the whole time," he wrote in a Facebook post. Those seven bullets were the second time he had been shot; his murder was the third. Even within the Ferguson protest movement he was a divisive figure, once physically attacking fellow activist DeRay McKesson in a parking lot. The "Ferguson body count" is only plausible if you exclude all exculpatory evidence, insist every police statement is a lie, and failed high school statistics. It's distressing to see activists pushing such a deranged conspiracy theory, but it's even sadder to see media outlets fanning the flames. This entry was posted in Politics and tagged Black Lives Matter, Ferguson, Michael Brown. Bookmark the permalink.